What drove economic growth in pre-industrial Europe, 1300-1800? The Industrial Revolution is arguably the most important break in global economic history, separating a world of at best very modest improvements in real incomes from the period of ‘modern economic growth’. Thanks to pioneering work of van Leeuwen and van Zanden (2012) and Broadberry et al (2015) this phenomenon has recently been linked to the study of long-term trends in per capita GDP. One of the questions is to what extent growth before 1750 helps to explain the break that occurs after that date; the idea of a ‘Little Divergence’ within Europe has been suggested as part of the explanation why the Industrial Revolution occurred in this part of the world. This ‘Little Divergence’ is the process whereby the North Sea Area (the UK and the Low Countries) developed into the most prosperous and dynamic part of the Continent. 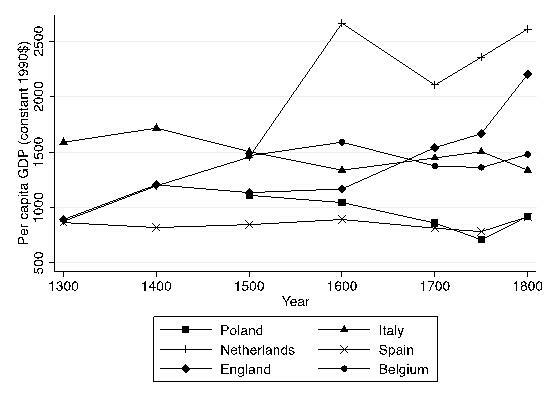 The new series on per capita GDP demonstrate that the Low Countries and England witnessed almost continuous growth between the 14th and the 18th century, whereas in other parts of the continent real incomes went down in the long run (Italy), or stagnated at best (Portugal, Spain, Germany, Sweden and Poland) (see Figure 1). As a consequence, at the dawn of the Industrial Revolution in the 1750s, the level of GDP per capita of Holland and England had increased to 2355 and 1666 (international) dollars of 1990 respectively, compared to 876 and 919 dollar in 1347 (just before the arrival of the Black Death), and 1454 and 1134 in 1500 (Bolt and van Zanden 2014). Gross Domestic Product per capita, 1300-1800. Although the ‘Little Divergence’ between the North Sea area and the rest of the continent has been established, very little is known about the causes of this phase of pre-industrial growth. Why were the Low Countries and England already long before 1800 able to break through Malthusian constraints and generate a process of almost continuous economic growth? Various hypotheses have been suggested. One of the explanations focuses on institutional changes. The rise of socio-political institutions (in particular the rise of active parliaments) and demographic institutions (notably the European Marriage Pattern) were favourable for growth in the Low Countries and England (de Moor and van Zanden 2010, van Zanden et al 2012). Other scholars have stressed the importance of the growth of overseas (e.g. Acemoglu et al 2005) – a hypothesis which is supported by Allen’s (2003) study explaining differences in real wages in Europe between 1300 and 1800. Finally, others have indicated the importance of increases in agricultural productivity (Overton 1996) and human capital formation (Baten and van Zanden 2008). In a new EHES working paper paper, we have tested the various hypotheses explaining pre-industrial growth in early modern Europe using new data on per capita GDP, political institutions (active parliaments), human capital formation (per capita book consumption), productivity in agriculture (yield ratio’s), and international trade (per capita size of the merchant fleet). Our empirical findings show that GDP growth before the Industrial Revolution was mainly driven by human capital formation. We moreover show that institutional changes (the rise of active Parliaments) were closely related to pre-industrial growth. Acemoglu, Daron, Simon Johnson, and James A. Robinson. “The Rise of Europe: Atlantic Trade, Institutional Change and Growth.” American Economic Review 95, no. 3 (2005): 546-79. Allen, Robert C. “Progress and Poverty in Early Modern Europe.” Economic History Review LVI, no. 3 (2003): 403-43. Baten, Joerg, and Jan Luiten van Zanden. “Book Production and the Onset of Modern Economic Growth.” Journal of Economic Growth 13, no. 3 (2008): 217-35.
historical national accounts.” Economic History Review 67, no. 3 (2014): 627-51. De Moor, Tine, and Jan Luiten van Zanden. 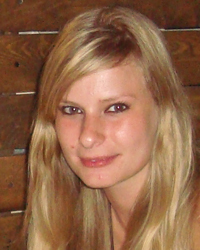 “Girl Power: The European Marriage Pattern and Labour Markets in the North Sea Region in the Late Medieval and Early Modern Period.” Economic History Review 63, no. 1 (2010a): 1-33. Overton, Mark. Agricultural Revolution in England: The Transformation of the Agrarian Economy 1500-1850. Cambridge: Cambridge University Press, 1996. Van Zanden, Jan Luiten, and Bas van Leeuwen. “Persistent but not Consistent: The Growth of National Income in Holland, 1347-1807.” Explorations in Economic History 49, no. 2 (2012): 119-30. Van Zanden, Jan Luiten, Eltjo Buringh, and Maarten Bosker. 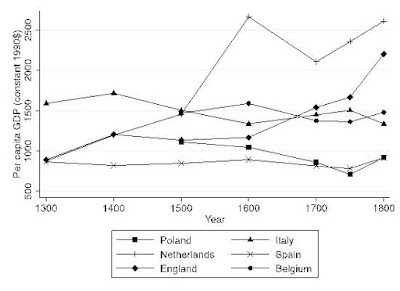 “The Rise and Decline of European Parliaments, 1188-1789.” Economic History Review 65, no. 3 (2012): 835-61.